Jakarta Globe on Mar 23, 2012 posted on its website that Indonesia and China signed six agreements and prospective deals worth at least $17 billion. The deals, signed in Beijing, are reported to be in the fields of mining, hydropower and steel. This is following China's President Hu's six-point proposal to expand links with Indonesia in oil, gas, mining, electricity, space and renewable energy. I am particularly interested in the effort by the two Asian economies to strengthen ties in renewable energy. As indicated in the report, China would be collaborating with Indonesia in the development and installation of hydroelectric power generators, and probably solar PV. Note that China is currently the largest producer of solar modules and is very aggressive in promoting the solar PV industry. With these deals and agreements, it is expected that Indonesia will step up the gear in renewable energy initiatives as in Thailand, Malaysia and the Philippine. In South East Asia, Thailand is the fore runner in renewable energy industries. China is currently Malaysia's biggest trading partner but on few occasions (months) is surpassed by Singapore. In January 2012, Malaysia's top 5 trading partners are China, Singapore, Japan, EU, and the United States in that order. Beijing. Indonesia and China strengthened their bilateral relations on Friday with the signing of six agreements and prospective deals worth potentially more than $17 billion.The agreements followed talks on Friday between visiting Indonesian President Susilo Bambang Yudhoyono and Chinese President Hu Jintao, in which both sides reaffirmed the importance of relations. “Both countries have the spirit to increase strategic cooperation in various sectors,” said Yudhoyono, who received an honorary doctorate from Tsinghua University on Friday afternoon. Hu and Yudhoyono witnessed the signing of agreements on maritime cooperation, fighting drug trafficking, trade statistics, Chinese visitors to Indonesia and a joint oceanography and weather-research institute. China’s Foreign Ministry quoted Hu as telling Yudhoyono that China supported the idea of Indonesia playing a greater international role and that it wanted to expand bilateral cooperation on global affairs. Hu made a six-point proposal, which was welcomed by Yudhoyono, to “strengthen strategic communication,” increase trade and broaden ties in other areas. 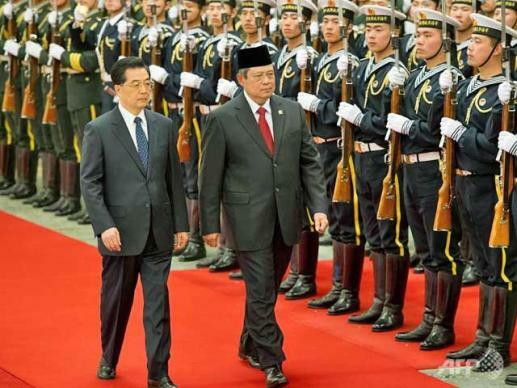 Indonesian and Chinese business leaders also reached agreements worth $17.4 billion, Yudhoyono said. “The cooperation has been agreed upon in 15 memorandums of understanding. The sectors in which cooperation has been established include seaports, roads, alternative energy, the motorcycle industry, mining, construction in strategic areas and steel industry,” he said. Chinese state news agency Xinhua said companies attending the business summit included China Huadian Corp., China National Offshore Oil, China Harbor Engineering and Indonesian state steel maker Krakatau Steel. Yudhoyono said Indonesia welcomed Chinese companies to invest in the country and assist with infrastructure projects. Hu said the two nations were on track to Reaching $80 billion in bilateral trade by 2015.